Restaurant Review: Afternoon Tea at Helene’s Tearoom, Skipton. so there is more to this little tearoom than first meets the eye. between customers when they cannot help but sing along. tea and coffee on our arrival which came in ceramic floral pots. Our tea was presented by Helene on a three-tier wooden teacup-shaped stand. I have never seen such pretty, gorgeously presented food. There was a selection of dainty sandwiches including smoked salmon and cucumber, ham and Wensleydale and local chutney. Each sandwich was light, very fresh and was made up of two different types of bread. There were slices of asparagus quiche which was delicious and bursting with seasonal flavor. and the quaint presentation made for an absolutely perfect afternoon. jacket potatoes and sandwiches are served over the lunchtime period. Please See: Winser London pink knitted jacket, broderie top, skinny jeans and pink brogues. Previous Post How to Work from Home During the Summer Holiday plus My Favourite Pompom Dress Midi Dress. My word that looks delicious! I wish I lived a bit nearer to Skipton! High tea time is amazing! Feels so luxurious! I've been to it once and I can't wait to go again. It looks absolutely divine! 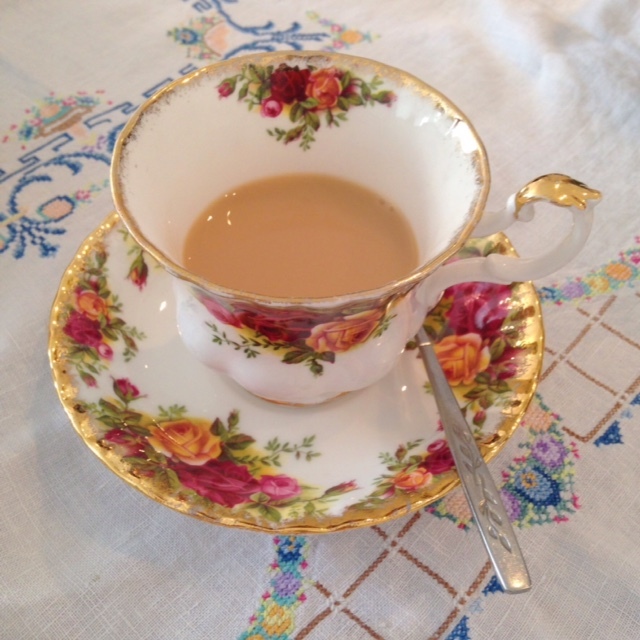 I love the crockery used to serve everything in – so English, prim and proper (and I mean that in a lovely way lol! ).